LOCATION.--Lat 39`58'04", long 75`11'20", Philadelphia County, Hydrologic Unit 02040203, on right bank 150 ft upstream from Fairmount Dam, 1,500 ft upstream from bridge on Spring Garden Street in Philadelphia, and 8.7 mi upstream from mouth. Water-quality sampling site 1.6 mi upstream. PERIOD OF RECORD.--October 1931 to current year. 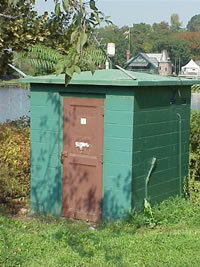 GAGE.--Water-stage recorder, water-quality monitor, Pluvio precipitation gage, and concrete control. Datum of gage is 5.74 ft above National Geodetic Vertical Datum of 1929. Prior to Nov. 25, 1956, water-stage recorder at site on right bank just upstream from Fairmount Dam at same datum. Nov. 26, 1956, to Oct. 6, 1966, water-stage recorder at site on left bank 40 ft upstream from Fairmount Dam at same datum. Satellite telemetry at station. COOPERATION.--Funding for the operation of this station is provided by the City of Philadelphia Water Department, the U.S. Army Corps of Engineers, Philadelphia District, and the U.S. Geological Survey. REMARKS.-- Calibration of specific conductance, dissolved oxygen, and pH instrumentation is conducted exclusively by Philadelphia Water Department personnel with USGS oversight. Erroneous or missing data, resulting from instrument malfunction, are not the responsibility of USGS. The 30-minute precipitation data for this station are temporary and will only be displayed for 120 days. Time series of 1-hour or cumulative daily values will NOT be available for retrieval following the 120-day display period. Although the instrumentation is calibrated at least once a year, the temporary classification means that documented routine inspections and other quality assurance measures are not performed that would make the data acceptable for archival, retrieval, or future use in general scientific or interpretive studies. Supplied by NWS: Action stage-10 ft, at 10.4 ft Kelly Drive floods/closes between North Ferry Road and Falls Bridge; Flood stage-11 ft, Kelly Drive is flooded and closed between Hunting Park Avenue and Falls Bridge; Flat Rock area is flooded; Moderate flood stage-13 ft, Main Street in Manayunk is closed from Ridge Avenue to Leverington Street; Major flood stage-15.5 ft. This station managed by the PAWSC Downingtown Field Office. Add up to 2 more sites and replot for "Dissolved oxygen, water, unfiltered, percent of saturation"
Add up to 2 more sites and replot for "Barometric pressure (BP), uncorrected, pounds per square inch"
Add up to 2 more sites and replot for "Photosynthetically active radiation (average flux density on a horizontal surface during measurement interval), micromoles of photons per square meter per second"